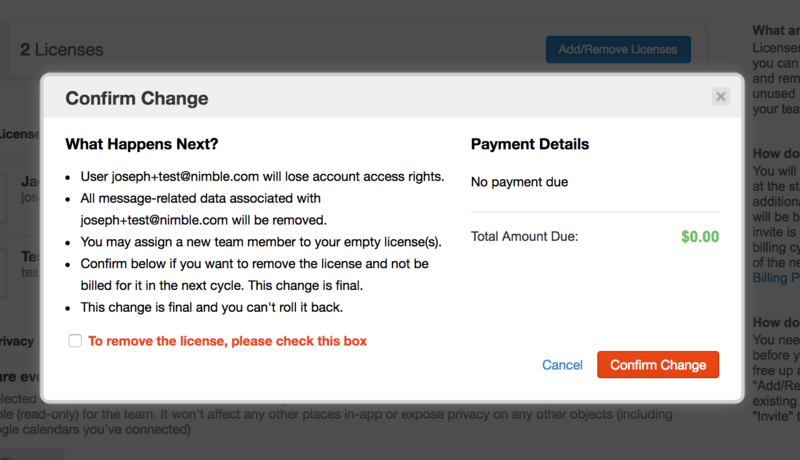 Nimble’s pricing is based on the # of licenses you have allocated in your account. To add new team members to your account, you will first need to add a license. How do I add Licenses and Users? 3. Select “Add/Remove Licenses” and then use the "+" icon to select the # of licenses you wish to add to your account. 4. You will then be asked to confirm the number of licenses you are adding to your account. You will be billed at the time of adding a license to your account on a pro-rated basis. 5. Once you have added license to your account, select “Invite Users”. 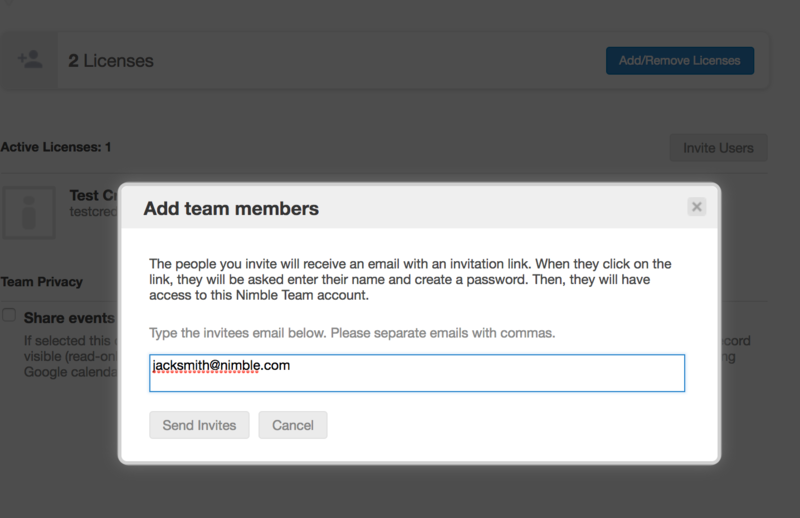 Type in the email address for the team members you are inviting to Nimble. Separate each email with a comma. 6. Your team members will then receive an invitation to join. When they click on the link, all they have to do is enter their name and create a password and they will join your team account. How do I reassign a license to a new Nimble team member? If you wish to reassign the license to a new team member, do not remove the associated license when removing a user. Otherwise, you will have to pay to add a new license. Once you have removed the user, select "Invite Users" to occupy the empty license. You will be billed for the total number of seats at the start of your billing period. If you add an additional seat during your billing cycle, you will be billed a pro-rated amount at the time the seat is added. You will be charged in full at the start of the next cycle. No refunds are issued. Will I be billed for unoccupied licenses? Yes, if you have more licenses than users, you will be billed monthly for those additional licenses. What happens if I decrease the number of licenses on my account? You will be charged only for the total # of licenses you have on your billing period. There are no refunds for licenses removed during a billing period. What if I'm a customer of a Microsoft reseller? If you are a customer of a Microsoft reseller, you will need to purchase your licenses through your reseller. You will get access to the additional licenses once the order has been placed. If you have questions about billing, please write to us at billing@nimble.com and we'll be happy to assist!